White high school teachers expect significantly less academic success from their black students—especially boys—than black teachers looking at the same students, a new study shows. When a black teacher and a white teacher evaluate the same black student, the white teacher is about 30 percent less likely to predict he or she will complete a four-year college degree, researchers say. White teachers are also 12 percent less likely to expect that their black students will graduate from high school. 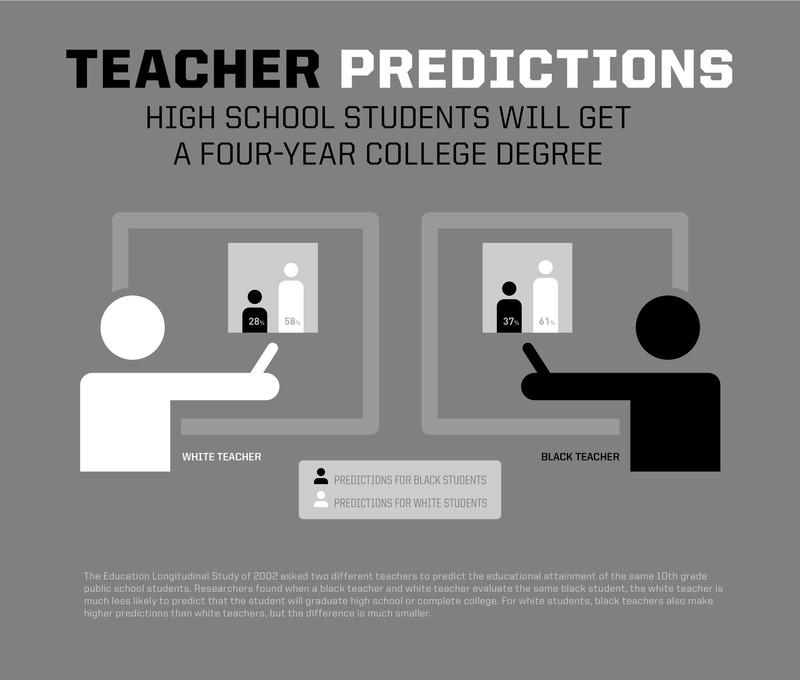 The study suggests that the more modest expectations of some teachers could become self-fulfilling prophecies. Low expectations can affect performance, particularly by disadvantaged students lacking role models to counteract a teacher’s low expectations, Papageorge says. The findings, published in the journal Economics of Education Review, also likely apply beyond the education system, and could lead to racial biases in the workplace, the service industry, and the criminal justice system. The researchers analyzed data from the Educational Longitudinal Study of 2002, an ongoing study following 8,400 10th grade public school students. That survey asked two different teachers, who each taught a particular student in either math or reading, to predict how far that one student would go in school. With white students, the ratings from both teachers tended to be the same. But with black students, boys in particular, there were big differences: The white teachers had much lower expectations than black teachers for how far the black students would go in school. White and other non-black teachers were 12 percent more likely than black teachers to predict black students wouldn’t finish high school. Non-black teachers were 12 percent less likely to expect black students to complete a four-year college degree. Expectations dropped further for non-black teachers of a different gender than the student. The drop increased even more for black boys, especially when their math teacher was making the assessment. Non-black teachers were 5 percent more likely to predict their black boy students wouldn’t graduate high school than their black girls. Black female teachers were significantly more optimistic about black boys completing high school than any other teachers. They were 20 percent less likely than white teachers to predict their student wouldn’t graduate high school, and 30 percent less likely to say that than black male teachers. White male teachers are 10 to 20 percent more likely to have low expectations for black female students. Math teachers were significantly more likely to have low expectations for girls. For black students, particularly black boys, having a non-black teacher in a 10th grade subject made them much less likely to pursue that subject further in later classes. This suggests that biased teacher expectations have long-term effects on student outcomes, the researchers say. “While the evidence of systematic racial bias in teachers’ expectations uncovered in the current study are certainly troubling and provocative, they also raise a host of related policy-relevant questions that our research team plans to address in the near future,” says coauthor Seth Gershenson, assistant professor of public policy at American University. The American Educational Research Association supported the work.